Tube heat sealing with a production plastic tube heat sealer. Pneumatically -operated and adjustable for the smallest to the largest plastic squeeze tubes. Production tube heat sealing for plastic tubes up to 12" high - with 24” of heat sealing bar length for multiple tube heat sealing of squeeze tubes. All heat sealing controls are solid state to assure accurate control of seal heat, heat seal time and cooling time. Integral air pressure regulator allows precise control of heat seal jaw pressure. Feed-through design allows removal of the heat sealed plastic tubes from either end. Two custom-made heat seal tube racks are included (load while heat sealing) with the sealer. 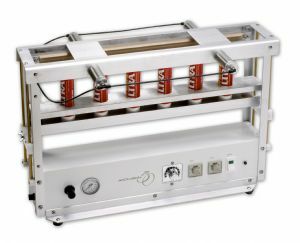 Tube heat sealer is made in USA with two year warranty. Heat sealed and unsealed laminated tubes in rack - tube heat sealer can thermal seal plastic and laminated aluminum squeeze tubes. Interchangeable racks pull out of tube heat sealer - sealing one rack of plastic tubes while manually filling the other rack of plastic squeeze tubes.